From - Political Resident A senior ranking political representative (equivalent to a Consul General) from the diplomatic corps of the Government of India or one of its subordinate provincial governments, in charge of a Political Residency. , at Kuwait. 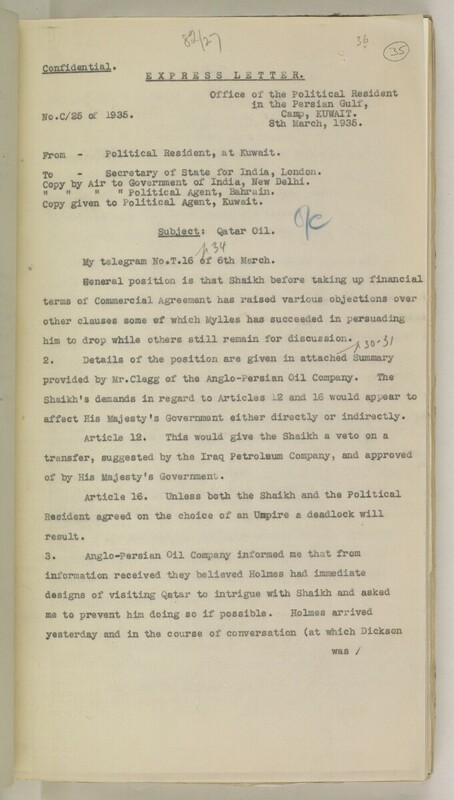 To • Secretary of State for India, London. it ♦» w « Political Agent A mid-ranking political representative (equivalent to a Consul) from the diplomatic corps of the Government of India or one of its subordinate provincial governments, in charge of a Political Agency. , Bahrain. Copy given to Political Agent A mid-ranking political representative (equivalent to a Consul) from the diplomatic corps of the Government of India or one of its subordinate provincial governments, in charge of a Political Agency. , Kuwait. My telegram No»T#16 if 6th March. affect His Majesty's Government either directly or indirectly.